I believe every citizen should be able to track how every one of their dollars, euros or pounds is spent. Nowhere is this desire to know the destination of our tax dollars more heightened than in education, where we can sometimes feel, as teachers and as parents, very little creeps through into our classrooms and professional development. Obama's administration is leading the way in showing how this could happen soon. Last year, within days of becoming President of the USA, Barack Obama announced his intention to create a more open, collaborative and participative form of Government. Soon after, as he pushed through his response to the economic crisis, the Recovery Bill, he was keen that this $98.2bn spend was also monitorable by the people paying for it. Thus at the end of last year launched Recovery.com, a portal to keep an eye on how every dollar is spent, where it is spent and what the recipients of it manage to do with it: creating or safeguarding jobs, gaining new contracts for services. It's not just agency bureaucracy figures, but also user-generated reports from the people and companies who have benefited from grants or investments. Heck, they even make the data available as a KML file or as text so you can have a play with it, too. But where is Recovery.com/education? Indeed, why does such a detailed tracker not exist outside the period of crisis, for all of our public services? Education budgets are admittedly, if we believe our politicians, often saved from cuts (just don't tell the guys in California); it's the one area alongside health that voters don't like to see shaved. Yet, in Scotland as elsewhere, 2011 will see a real cut in the amount spent in classrooms, with Local Authorities and individual school head teachers having to make tricky choices, or learn how to save money in the areas where, in the period of boom, inefficiencies had crept in unnoticed. more transparency before those who are receiving the service. Many a costly decision in quangos, local authorities and schools would be questioned by those closest to the delivery of the service - today they're often the last to know. Better still, Recovery.com is not just a pretty-fied spreadsheet of what money headed out according to the agencies - it's a two-way service, allowing recipients of money to demonstrate what they've done with it, show the true effect of investment and grants in their local area. If £4m is spent in my High School annually and I, as a classroom teacher, am being told that my entire professional development allocation for the year will be only £50, then having access to that data would allow me to either understand a savvy management decision or question its validity. So, would this appeal to school leaders, Local Administrators, Heads of Education, Superintendents? The data's there already, from their petrol expenses to their Xerox accounts. I, for one, would be generous in my time to show them that Flashmeeting and Google Docs could save them... well, I don't (yet) know how much. Your Brain Deals With 34GB Of Data Every Day. Time To Reboot? Glasgow Art School graduate James Houston's Big Ideas (Don't Get Any) on CentralStation. "The speed of modern life is 2.3 words per second, or about 100,000 words a day. That is the verbiage bombarding the average person in the 12 hours they are typically awake and “consuming” information, according to a new study. "...We are faced with the equivalent of 34 gigabytes of information each day — enough to overload the typical laptop inside a week. "The total amount of words “consumed” in the United States has more than doubled from 4,500 trillion in 1980 to 10,845 trillion in 2008. Those estimates do not include people simply talking to one another. Total information consumption from televisions, computers and other media was estimated at 3.6 zettabytes (3.6m million gigabytes) in 2008. "It may be infuriating but it is no threat to the brain itself, say experts. "In some ways, he adds, what has changed is the nature of information more than quantity. Where we now stare at a computer screen, once we studied faces, which may involve absorbing just as much data." Just bear that in mind when your inbox is labouring under 300 emails, 1400 feeds and relentless Twitter friend requests. The blog has been really quiet this past couple of weeks, down to the quantity of face-to-face, travel, canoeing and wrapping up of some major projects that has somewhat swamped me. Coming up over the next few weeks will be a series of small-ish blog posts, covering my thoughts, workshops, films and presentations that I've been developing this past month in the States. In the meantime, to reassure that I have not indeed expired, please let me take Christian Long up on his invitation from last June. Way back in the beginning of June, Christian posted an interesting meme: what's the "worst job" you ever had that, ironically, helped prepare you to one day become an educator? For me, hands down, it was one of the best worst jobs I had as a student that wins the accolade: copy taker at the Edinburgh Evening News "Pink". The Pink was a Saturday newspaper published by the Scotsman family of papers which, within 15 minutes of the final whistles being blown on football matches around the country, was sitting on the shelves of Edinburgh newsagents and being shoved into the hands of fans as they left the stadium. It's no surprise that such a high-speed print operation became defunct in 2002, an age where people began to get full-time results as text messages on their mobile phones and, increasingly, video highlights and match commentaries through the same devices within seconds of the events occurring. However, the flow of work there was a great lesson in making a crust through speed, accuracy, good humour and, yes, homework. Let me explain. The reporters out around the country would phone in to the Scotsman offices around five times each over a Saturday afternoon: the pre-match period about 30 minutes before kick-off with the team names (all those Eastern European ones with no vowels being spelt out at great pain to the reporter) and an atmospheric team news paragraph, which would be para number two; the first half full-time scores (these would arrive within as much as twenty minutes of the actual half-time whistle in a slow-moving match) and two more paragraphs; the beginning of the second half (with any team changes and fresh scores); just before full-time, with the 'final score' (in inverted commas since we were going to press without knowing for sure) and then, only if something changed in the dying moments of the match, a fifth and final call would be made with great excitement and the fresh score news. The person who got all this information and had to get it through into a system that the sub-editors could work with, and apply to the actual page, was the copytaker. I was one of a team of about six. I was the only male. And the only one under 50 (and some: I was only 17 when I started). Worse still, kids, I had lied to get the job, saying I could touch type at sixty words per minute. I could go fast but, much like today, I went to the "go-as-hell-a-fast-as-you-can" school of typing, which necessitated three things: nerves of steel, great confidence in one's fingers to 'feel' it and, finally, sight of the letters on the keyboard. When I came down for the initial interview and typing test I was read a story from the day's paper. As Margaret Turner, my superb but nippy potential boss, began to read, I looked down to begin rattling the keyboard. I had never come across the problem certain female computer users must face every day. With long artificial nails, these 50 plussers had managed to scrub out any sign that had ever appeared on those grey-with-dirt keyboards. They were now completely blank. I kicked my memory into overtime as I spent at least three sentences-worth of job interview and typing test starting, backspacing and restarting my efforts, as I worked out where on earth 'q' and 'p' were. Once I found my flow I had my memory catch up with Margaret. I finished the test barely six words behind her, an impressive speed of 58 words a minute. It was good enough for her, and bloody impressive for me given that I had spent about 20 of those words working out the blank keyboard in front of me and that, until that minute of reading out loud, had never heard what sixty words per minute sounds like (it's rather fast). So, every Saturday at one, I'd head over the Meadows in Edinburgh down to the Scotsman offices on North Bridge, now some swanky hotel, and take up my place at the window which overlooked the whole of Princes Street and Waverley Station (we saw the guys jumping off the Bridge every four months or so - always on a Saturday afternoon it seemed). I was subjected to some of the most profoundly proud moments of my professional life - ever - as rather well known sporting reporters would let me know that I was the best copytaker they'd ever had (within two months I knew how to spell the names of all the footballers in the four main leagues and various juniors and seniors leagues). They appreciated the effort I had put in to go from being pretty awful, meriting the curses of every screaming reporter at the biggest stadium in the country as he tried to file the 90th minute goal in time for the final print, to being pretty damned good. I was able to decipher meaning quickly despite the fact 80,000 fans were screaming rather loudly behind the reporter. It was as much my report, I sometimes felt, as the reporter who had attempted to make himself heard down the phoneline at Ibrox, Celtic Park or Dens. I stuck at the job for two years, eventually ending up writing for the paper thanks to some help from a generous sports editor, Paul Greaves. He's now the Editor of the whole operation. I learned how to fulfill your promises, get better at something you had no interest in and enjoy doing it, how, as a young and 'worthless' rookie, to wag chins with the people you admire, and not let them know you admire them. Above all, I learned what it felt like to earn your own good money by putting in the hours no-one else wanted to do. I worked overtime, back shifts, evening shifts and even did the night shift at election time. I earned double time, triple time and bonuses, for three of the House's newspapers. I learned how to take down farming reports, the most demanding literature I've ever had to write, getting them colon, comma and dash correct from the garble down the phoneline despite having given up maths aged 16. Basically, I learnt what it means to work: nothing stays the same so you always have to relearn it (even typing), no-one will do you any favours (unless you ask the Sports Editor for one) and you'll end up with the Editor's desk with the nice view when you least expect it. And you may never even notice that. It was the first time that, as a paid employee, I had the confidence (encouraged by Margaret Turner) to occasionally tell writers, editors and subs - all of them senior to me - that they were wrong, and I was right, and that they really should just go back to their desk and get out of my office. My office. In time, they stopped taking their problems out on the lad (me) at the bottom of the food chain, and asked for favours from me instead to cover their mistakes over. Those couple of years were a hoot and, I guess, that remains the main raison d'etre of work for me. If work doesn't feel like escapism, play, fun... then it's not something I want to be doing. If it's not fun any more, I've not done it any more. I've found or made up something else and made it happen. If those reporters, writers and subs attempt to put barriers in my way, I tell them to get out of my way. Fast. Before the barriers become too big to overcome. Not a bad set of lessons from the bottom of the newspaper foodchain. Why would you use words on the screen when they do just fine in your mouth? David Jakes and Dean Shareski show us that it's not just what you say, but how you say it. It's 21 years since PowerPoint was invented, 21 years since we've had to relearn how we communicate, to get away from the bullet-point death into which many of us were induced throughout the nineties and right up to the current day. When we experience a presentation we experience it in two ways - through the auditory nerves (ears) and the optical nerves (eyes). The brain is geared up to seeing above all else: 30% of the cortex is devoted to visual processing, only 8% for touch and 3% for hearing. So, biology tells us that our presentations must be, above all, visual. PowerPoint doesn't kill presentations. Bullet points do. We need to move our students away from text-based presentations. The text is in what we say. "Why would you use words on the screen when they do just fine in your mouth?" Seth Godin. It's not about killing all the words in a presentation, but if you remove most of them then the presenter has to internalise the content. Great for learners. But great for listeners, too. Our cognitive load will tend to move into overload if we have too much going on through the screen as we listen to the words from the presenter. Flickr is great for finding images, but Flickrstorm is another alternative, which makes it easier to search within the creative commons images contained on Flickr, add them to your tray of photos, and download all of them at once, providing you simultaneously with the original URL of each picture. iStockphoto is a pay-for site but gives an exceptional quality of image. The best part for presentations, is that images can be searched for with white space in particular areas. Tell the advanced search that you want to have images with whitespace in the top left corner, so that your text there can be legible, and it will return images that suit your means perfectly. Creative Commons is the licence that tells people how they can use your content in their own sites or project, legally. There are several types of licence which are important to understand. Not everyone does, so it needs taught, not caught. Design is often seen as the thing that we get around to eventually, "if there's enough time to get to it". Design is key. It's the first thing we need to consider. It changes the way we develop our original idea so fundamentally, we're best to approach things from a design perspective from the outset. The first thing we need to do is strip away the template that came with the presentation package. We also need to strip away anything that's minor, that we can simply add in passing. Then, can we reduce what's left to once sentence, with an image that speaks 1000 words telling us everything we need to know, along with the oral presentation that we're giving. In libraries we see children copy and paste chunks of text, learning nothing about that particular topic. Children need to learn how to craft and sell a message. Communication is the transfer of emotion (another Godin-ism). Fire trucks are becoming yellow - it's the most noticeable colour in our spectrum. Green signifies renewal for most cultures. Red signifies alertness or anger in most cultures. Americans do indeed seem to have a preference for the colour blue, deep blue signifying trust. Combining national preference with the most flashy colour leads Blockbusters and Goodyear to the logos they have. "Comic sans is illegal in 34 States," says Jakes. Serif fonts help you move from one word to the next, great for when you're reading. But in presentations you don't want your audience to be reading - you want them to be listening to you. Therefore, in presentations we need to use Sans Serif fonts. With American audiences, avoid the use of Helvetica - it's used by the Inland Revenue Service. Everything on the web these days, if it's worth watching, has the word <EMBED> next to it. But if YouTube or Google Video is blocked in your school district then students need to learn how to use Vixy or ZamZar to convert online video at home to a hard file they can import into their presentation. Pressing the button B makes the PowerPoint go blank. W makes the screen go white. Typing the number of a slide will take you to a slide, even if it's a hidden slide that we didn't see in the main presentation. Dan Roam's new book is the quickest read (it took me a Sunday afternoon) but one of the most valuable if you present. 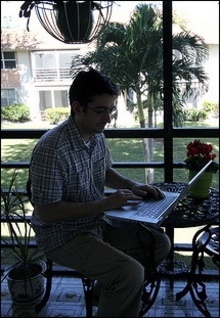 As education and blogging working environments go, South Florida has a lot going for it. In the few days run up to the South East and Mid-Atlantic Language and Technology Conference in Fort Lauderdale, I've been teleworking down the road in Boca Raton, in the warmth and generosity of our host, Frank Kruger-Robbins. It's got me thinking (again) about the need for places of work and learning, and how schools might evolve in the future. It's been a treat here, and the time difference has been far less harrowing to work with than the one I had trouble catching up with in New Zealand. I'm up early, from about 6am, to work six hours or so through to midday. I can then spend the rest of the afternoon out in the sun, down by the pool or on the beach, or having a read in Barnes and Noble around the corner. Come early evening, I'm able to catch up in 20 minutes or so with the emails over-enthusiastic colleagues have thumped out before they, at their 10pm, head off to bed, leaving plenty of time to sample the Cuban treats, a Mojito or two, or the amazing food and drink of a crazy steak house. 4.00am: Catriona woke up with a bit of a teething temperature. We gave her some Calpol to bring her down (it worked) and, waiting to see how she got on, I tweeted for any advice. Six points came in within five minutes from colleagues in the UK just starting their first lessons - good for the next time. I also picked up on some emails just starting to come in from Glasgow, setting people off so that they could get on with their next moves. 8.30am: With some coffee on brew I emptied the rest of my emails, a few Local Authority requests for help on mobile phone strategies. David Muir Skypes in for a chat, and to talk about the superb Apple Institutes taking place at the University in March. 9.30am: I spent an hour on the phone with Don Tapscott's ThinkTank in Toronto. For two weeks we've had trouble fixing up a meeting because the UK time difference tends to work against US-Canada-UK working. Fascinating stuff on social media and how it transforms leadership. 10.30am: Spent some time working with one of Scotland's biggest teaching union on digital literacy, collaboratively on a Google doc between colleagues in Edinburgh and Glasgow. 11.00am: Started downloading and reading the latest research reports on social media in education and new learning spaces, including some interesting European research beginning to emerge from the Commission. It also gave a chance to work out what articles I need to be writing, for whom and for when. There are a fair few, plus a stack of trains and planes to book up for the next bout of work. ...but it does have a black gradient template. If you go down to the woods today in your Google Docs account you'll notice that you can create a new document, a new spreadsheet and, yes, a new presentation. Collaborative presentation writing has been born. It's great if you like using Microsoft Office tools, since it resembles PowerPoint pretty well. It's also got the distinct advantage of being a presentation tool on which you can collaborate with many other people, simultaneously or asynchronously. From this perspective, it makes school PowerPoint presentations something much more feasible, leaving F2F time for some more valuable types of learning to take place. The disadvantages? Limited fonts on offer, no facility to embed video (just images) and no transitions to make your presentation flow. I guess it depends on who you're presenting to, what you're presenting and with whom you're presenting it. But at least it's there. Another handy tool in the box. They've even put up a wee video to show how it might be used. This morning I'm speaking to the Depute Heads in East Lothian at their conference, the theme of which is "Rebuilding Our Schools Without Touching A Brick", named by Don, the Head of Education, after the post I wrote on Hans Leganger's talk on his team's amazing turnaround of the Stovner School in Norway. The multitouch screen of Jef Han, which I can see become a replacement for the traditional desk, or at least a vital edition to presentation areas in schools. The adjustable keyboard would make life easier, perhaps, in specialist schools and for younger learners (and large fingered teachers). The latest magazine technology where pages come alive with video and audio, and we wonder why we ever thought of paper as two dimensional. The polarised glass changing rooms in Prada, which made me think what might happen if that video mirror become a video wall - the walls of a classroom change for every subject we are talking about. The feedback wall on the London Science Museum based around the London UNderground - what an amazing way to display the news from the pupil council, or for individuals to text 'live' about what they're feeling about their school. The Bumpit computer interface, where we ask why things have to stay the way we think they should. Yes, I do want to hang my .doc and .txt from the 'wall' of my computer. Yes, why not have files which are more important actually looking bigger and feeling heavier? The entertaining signs planted by guerilla teams in the New York underground. When no-one reads signs that start 'don't' anyway (and schools are full of them) why not have some fun and make the ethos of a school happy rather than just 'correct'? Not included, but people should check out the possibilities for some cool presentations on place and geography through Photosynth. 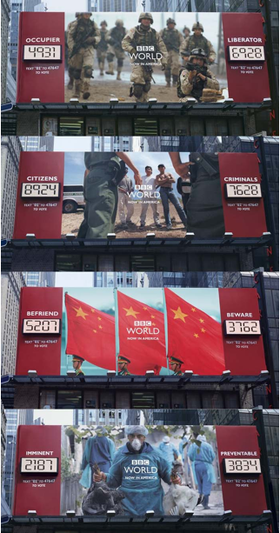 I've also got some links to the latest BBC World Service advertising campaign, where individuals can text to the billboard and see their vote on an issue count immediately. Imagine the same thing in a school hall, where kids can take regular votes on issues or interact with a moral question by simple text. All of these examples, (and some more ideas in this Futurelab paper on opening education spaces) which would require some touching of bricks or screens, are not intended to be carried out, of course. Their purpose is to set the level of imagination high, especially since some of them are along the lines of inventions the primary school kids in my colleague's Kathy McGrane's classroom were coming up with last week for their critical skills based enterprise projects. The main thrust of the talk, however, is to see how we could make all our schools more learner-centred in their design and in the interactions that take place there. The Stovner post from a month or so ago will give some of the radical approaches to timetable and curriculum design that were undertaken there (arguably less radical, though, than some of the ideas from TED), including the idea of chunking subjects in blocks of several hours with no breaks to allow students to succeed in their tasks, and using computers for longer periods of time in one go for the same reason. The flexibility afforded by these non-physical attributes is, however, being replicated in the flexibility I witnessed last week in our primary schools, with their open plan spaces, non-existent doors and corridors, their collegiate approach to learning (P7s work with P1s on a video project, P4-6 are working in the same room). Maybe it is time we start to think about whether learning with people the same age and rough ability as us is really the best way to learn. Maybe it is time we start to think about how we use our communal spaces. Maybe it's time we think about the use of time in the day, not just the school day. Maybe we look at the progression through sixth year in secondary as a way to experiment with some of our ideas in a school sector which, by comparison with the primary sector, has struggled to innovate beyond the rigid period-by-period timetable for the last 400 years. Maybe Stephen Heppell's suggestion of East Lothian Campus is not so wild (there's only 15,000 students, the same as a small university), and his suggestion of increasing adult presence in classrooms in return for a degree would help turn some of this into reality. What role is there for copying Stovner's outsourced education, where students go to another school to learn for a year or part of a year (East Lothian as a campus, international links, the role for blended learning to help students go to several schools at once)? What kind of learning spaces can we easily envisage in our schools? What's the line to be drawn between Open Source spaces (ones designed and adapted on a constant basis by the learner) and Open Plan spaces? Stovner's main success point was making that limited time with the students exciting, more exciting than it had been before. How can we make learning and teaching more exciting, for both the learners and the teachers? Update: I hope that their challenge outcomes will be shared somewhere. I had to run before they were completed. Rick gives two brilliantly simple things you can do to set your productivity soaring, and Don updates us on how more East Lothian managers are joining the Getting Things Done family. People often ask me: "How do you know the stuff you know?" My answer is: "I read about 700 websites a day and meet lots of interesting people online and F2F". Believe me, the only way you can do this is by following simple rules like the ones Rick and GTD suggest. Why not start (and maintain) your more effective and efficient life now? It's done wonders for me.